Returning to Nashville for their first headlining show since 2012 (notably, they passed through last fall to open for Ed Sheeran’s Nissan Stadium show, and even popped into Grimey’s for a quick in-store as well), Scottish by way of Northern Ireland alt rockers Snow Patrol are set to headline The Ryman Auditorium on April 23, out in support of last year’s comeback LP Wildness, their first in seven years. The beloved group will be supported by Brooklyn indie duo We Are Scientists and up and coming UK singer-songwriter Ryan McMullan, making for a particularly compelling bill, for which tickets are still available right here! However, we’re excited to announce that we’re also giving away pair of tickets to one lucky fan, so if you’d rather try for that route, read on for more about the show and enter for a chance to win below! While they rose to fame with their 2003 third album and major label debut, Final Straw, and became certifiable, intentional rockstars with 2006 followup Eyes Open, alt rock outfit Snow Patrol‘s origins extend much further back, formed by members from Northern Ireland while attending school in Scotland in 1994, and going through a series of early name changes before landing on Snow Patrol in ’97, then releasing their debut LP, Songs for Polarbears, the following year. Initially more rooted in indie rock, Snow Patrol’s first decade was characterized by critical adoration in the indie world, with a cult following in Europe as they regularly performed and honed their sound in early years, ultimately dropped by their label for poor sales, before soon getting scooped up by a major and working with producer Jacknife Lee, managing to break out in the alternative, power pop, and post-Britpop scene in the early ’00s, at a time when UK bands were struggling to command international attention. While early breakout tune “Run” helped put Snow Patrol on the map, it was Eyes Open‘s lead standout track “Chasing Cars” which truly brought them widespread fame, wracking up high positions on the charts, millions of downloads, and pushing the LP to multiplatinum certification. On the rise, the group began to play bigger and more high-profile shows, supporting the likes of acts like U2 and appearing at festivals and TV spots. Throughout the late ’00s, the band remained a fixture in popular music, finding continued success for 2008’s A Hundred Millions Suns and 2011’s Fallen Empires, before deciding to take a breather in 2012 to live life for a few years outside of the constant album and tour cycle the band had endured for a decade. While their break was only meant to last a few years, the group’s members fell into other creative endeavors, personal lives, and, in the case of frontman Gary Lightbody, newfound sobriety, before finally coming together to return with a seventh album, last year’s Wildness, once again overseen by Jacknife Lee. 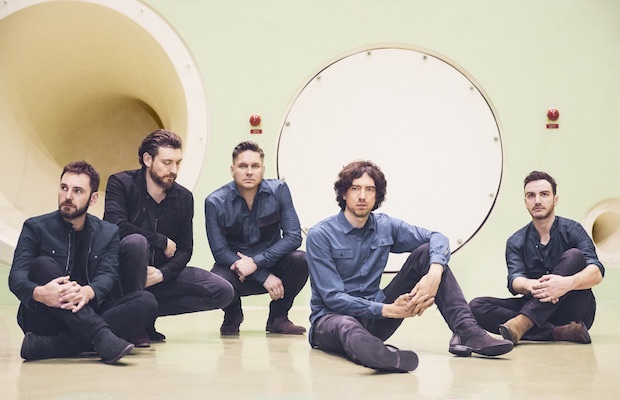 The result feels like a refreshed, focused Snow Patrol, more settled into adulthood, but still as sonically captivating as they’ve been from the start. While they made their way to Music City last fall to support Ed Sheeran at a gigantic Nissan Stadium show, even stopping through Grimey’s at the time for an in-store, Snow Patrol’s Ryman return will be their first headlining Nashville show in nearly seven years, and it’s definitely one not to miss. Though they formed in 2000 in Berkeley, California, it was after indie rock duo We Are Scientists‘ move to Brooklyn in the early ’00s that the group really broke out in a major way. Early years were characterized by some lineup changes, self-releases, and a scrappy DIY ethos, but with mounting buzz and a flourishing mainstream appetite for indie rock, the band, initially and for many years a trio, landed a major label deal with Virgin Records, and released their debut studio full-length, the more angular and post-punk rooted With Love and Squalor, in 2006, instantly propelling them to critical acclaim and commercial success, leading to high-profile tours, late night television appearances, and worldwide festival spots. Though the group have long been a bit bigger in the UK than the stateside, they remained a respectable part of the popular wave of indie rock throughout the aughts, landing just as much acclaim and a few standout singles with their 2008 sophomore effort, Brain Thrust Mastery. Longtime fans of comedy (they bonded over a love of watching standup), core members Keith Murray and Chris Cain starred in a series of comedy shorts on MTV UK at the end of last decade, and have long maintained a funny, lighthearted persona on stage, in interviews, and in videos, which has helped We Are Scientists endure as an approachable, fan-friendly act for over a decade and a half. Across 2010’s Barbara, 2014’s TV en Francais, and 2016’s Helter Seltzer, the group continued to hone their smart, pop-accessible, witty, and layered sound, embracing more synth flourish and pop influence, which feels especially refined with last year’s sixth full-length, Megaplex. A dynamic and throughly entertaining live outfit, We Are Scientists are a longtime favorite who never fail to disappoint and an inspired choice to support this show. While We Are Scientists are a bit of a contrast from Snow Patrol, with more indie rock and synth-soaked stylings, opener Ryan McMullan, who, like Snow Patrol, hails from Northern Ireland, is more in line with their more powerful, emotionally resonant, pop rock stylings (though with a bit more of an acoustic, singer-songwriter bent). Since springing onto the scene just a few years ago with his debut EP, the young up and comer has been attracting a lot of buzz, particularly in Europe, and with a powerful voice and wildly accessible knack for penning big, hooky-worth tunes, he’s definitely a rising artist to keep an eye on. Winner will be announced Saturday, April 20 at 12 p.m. CDT, and will receive one pair of tickets. Good luck! Win Tix to Snow Patrol at The Ryman! Snow Patrol, We Are Scientists, and Ryan McMullan will perform Tuesday, April 23 at The Ryman Auditorium. The show is all ages, begins at 7:30 p.m., and tickets are available to purchase for $35-39.50.